Heat oven to 350°F. Line 18 medium muffin cups, 2 1/2x1 1/4 inches, with paper baking cups. Split sandwich cookies in half. Place 1 cookie half, middle side up, in each cup. Or place 1 wafer cookie, flat side down, in each cup. In large bowl, beat cream cheese with electric mixer on medium speed until smooth. Gradually beat in 1 cup sugar and the cocoa until fluffy. Beat in vanilla. Beat in eggs, one at a time, until well blended. Divide evenly among cups (cups will be almost full). Bake cheesecakes 20 to 25 minutes or until centers are firm. Cool 15 minutes (cheesecake centers will sink while cooling). Refrigerate in muffin cups at least 1 hour; cover and refrigerate at least 1 hour longer before serving. In chilled small bowl, beat all Whipped Cream ingredients with electric mixer on high speed until stiff. Spoon Whipped Cream on chilled cheesecakes. Cover and refrigerate any remaining cheesecakes. Make these cheesecakes up to 1 month ahead of time. Refrigerate cheesecakes 1 hour. Place in labeled airtight freezer container and freeze. About 3 hours before serving, place covered cheesecakes in refrigerator to thaw. 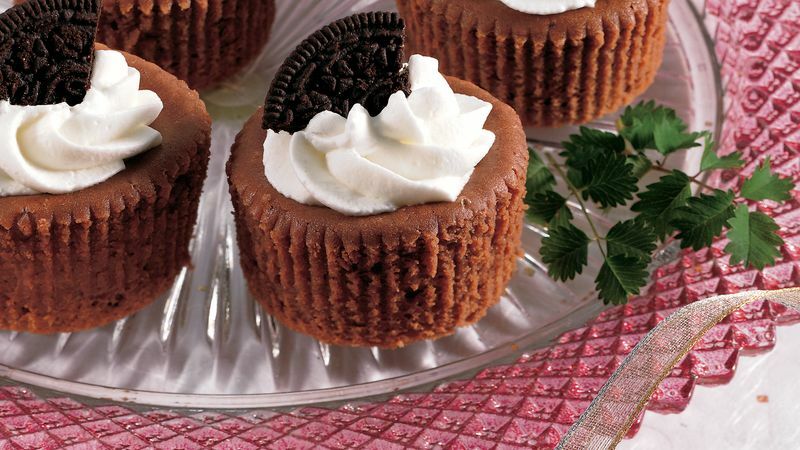 Garnish these festive cheesecakes with wedges of chocolate sandwich cookies.